Craving connection with like-minded professionals? Looking to make work more purposeful? Seeking to be supported and inspired? Join us for lunch and conversation on Monday, April 29th in Denver’s RiNo District. Come for peer conversations about life at work, making a difference, and creating more joy, growth and impact. If you're truly passionate about making change and creating positive impact, come to share your ideas and challenges with colleagues to receive support, learn new approaches, and hear new perspectives. We can all use reminders and strategies for how to implement and act on the things we already know and value as well as sparks of new insight to help us see the same situation in a whole new way. Either way, we’ve got you covered. You’ll find great connections, good food, and time to focus and reflect on work that matters. Discussion facilitated by Jessica Hartung, charter member of the Colorado Conscious Capitalism Chapter, serial entrepreneur and professional development expert. Her new book, The Conscious Professional:Transform Your Life at Work was released in January. Jessica brings her 20 years of experience leading executive retreats building conscious leadership to us as a volunteer of the Conscious Capitalism Chapter. Join innovators in health, wellness, and leadership at Catalyst’s Health-Tech Innovation building in Denver’s RiNo District. 3513 Brighton Blvd | Denver, CO.
more juice, and more contribution right away. Conscious Capitalism Colorado is excited to present three exciting speakers for our Fall Event. You won't want to miss this opportunity. Raj Sisodia, co founder of Conscious Capitalism, will present The Leading Edge of Conscious Capitalism in 2018. The current best practices and powerful successes. Heather Wickman from Untethered Consulting and Pete Dignan from Ever Better for a conversation about Creating the Deliberately Developmental Organization. A mindfulness practice can be a powerful tool for dealing with the fast-paced and high energy life of any entrepreneur. Focus is an important part of success, and mindfulness can improve focus, therefore improving productivity and creativity. Learn more about what you can do to apply mindfulness in your life to support your success. Stress is rampant in our homes and our workplaces. The implications of not dealing with stress in a healthy way is showing its ugly face in our relationships, jobs, and lifestyles. Some cry for multi-tasking, but the brain doesn’t get it. Let’s look at simple age-old hacks for improving our lives and increasing productivity at home and at work. After living in Asia for over 20 years, Todd learned to embrace an "Eastern" approach to life. He studied Buddhism under a Taiwanese Monk for over 10 years and indulged himself in Daoism, and other Eastern philosophies. Todd has practiced meditation daily for 20 years and embraces the shift in mindset that it brings. He has come to realize the power of mindfulness when applied to increase productivity and enhance employee relations. Mindfulness is a word that has many meanings to many people. Let’s get together to discuss applications of mindfulness and its role in Conscious Capitalism. Today's economy requires people-centered cultures, that can adapt quickly to change and consistently innovate in quick cycles. But, does all that people focus really lead to higher profits? In this cafe-style informal conversation, Lisa Jackson of Corporate Culture Pros shares WHY's behind the intensifying change landscape in society, and leads discussion on 3 pillars of profitable growth all organizations of the future need to be successful. Announcing an amazing upcoming event being hosted by one of our incredible partners, the Institute for Enterprise Ethics at DU. 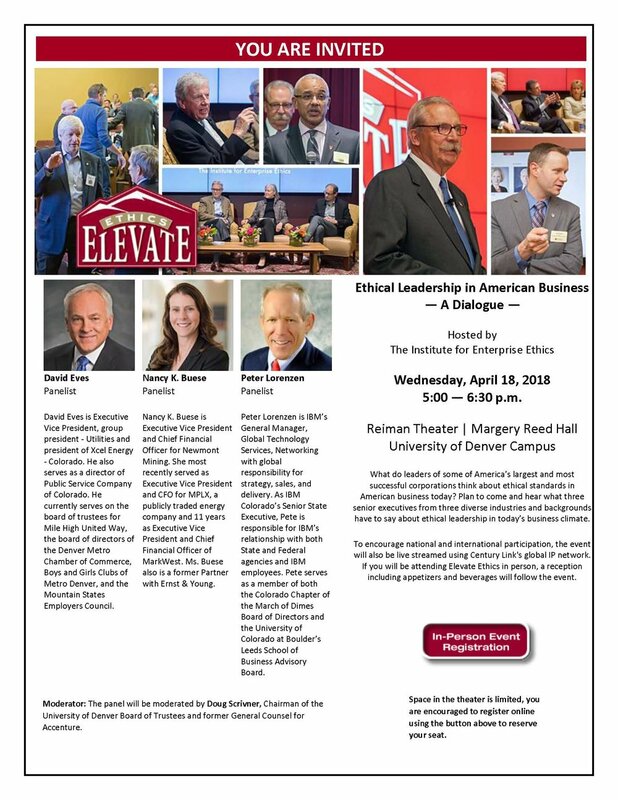 On April 18th, the Institute will be hosting an Ethical Leadership Dialogue with some pretty amazing business leaders about ethical issued companies are currently facing. Join us for this one-of-a-kind event. Trust underlies all the critical issues we hear about today from low employee engagement and commitment to culture, innovation, crises, scandals, and more. Numerous studies have shown that high trust organizations are 2-4 times more profitable than low trust groups. Do you know the true level of trust in your organization? High, spotty, awful? How about in your personal life with family and friends, or even trust in yourself? 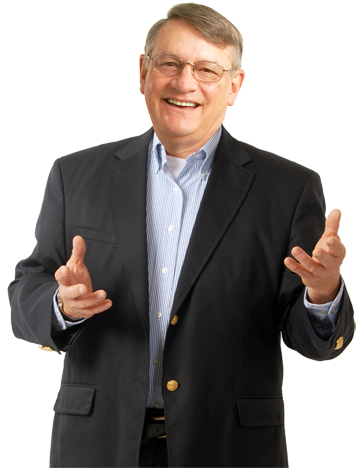 “The Trust Ambassador,” Bob Whipple, MBA CPLP.